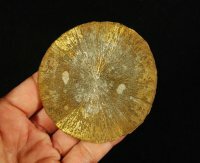 Iridescent Pyrite Sun Crystal Formation [PyriteSun-03] : Fossils Online, Welcome! 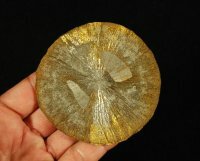 Iridescent pyrite sun with rainbow colors that shimmer in the sunlight. This is a natural formation of Iron sulphide crystals, also called 'fools gold' that are found only in a few coal mines of Illinois and China. The lights really make it pop just a bit more than it would look in person.